Stockman, a Republican who represented the Houston suburbs twice in the U.S. House before losing a longshot bid for the U.S. Senate in 2014, is accused of funneling more than $1 million of charitable donations toward personal and campaign expenses. HOUSTON — It’s a tale that has included hot air balloon rides, kennel bills and several purchases from one of those once-ubiquitous SkyMall catalogues — not to mention a new dishwasher, a pricey New Orleans hotel, flights to Africa, rehabilitation for alcoholism, an undercover intern and a trip to Disneyland. 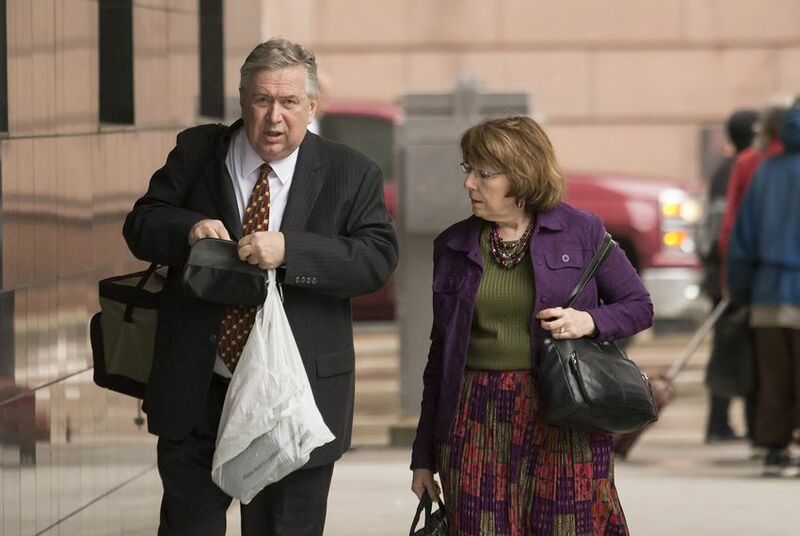 And it all came to a close Monday in a full, echoing federal courtroom here, where prosecutors made their final case against Steve Stockman, the former Texas congressman they say paid for that punch list with money he fraudulently took from a pair of wealthy conservative donors. They also laid out for jurors the pattern they say he used to pull it off: “Sham nonprofits,” “shell bank accounts,” “concealment.” Repeat. After three weeks of testimony about those various and sundry personal expenses, international travel of questionable purpose, undercover political surveillance and the charitable donations allegedly used to fund it all, jurors heard closing arguments this week. Stockman is charged with two dozen felonies, including wire and mail fraud, money laundering and violations of election law. Between May 2010 and October 2014, prosecutors allege, the Houston-area Republican solicited about $1.25 million in donations and used the money not for various charities — as donors were told — but instead on campaign and personal expenses for himself and his staff. Prosecutors allege that Stockman solicited charitable donations under false pretenses, telling donors he’d use their money to “educate” voters and renovate a Washington, D.C., building to become “Freedom House,” a site for training conservative interns, prosecutors said. As prosecutors stated and restated the case against him, Stockman looked on calmly, one hand to his face, spinning a pen between his fingers and scribbling the occasional note. Defense attorneys for Stockman countered that their client never misused donor money, and they described the contributions not as co-opted charitable gifts but rather as campaign donations slyly disguised as nonprofit philanthropy. The prosecution, said defense attorney Sean Buckley, is “throwing spaghetti at the wall” with the many charges against Stockman and trying to distract the jury with salacious tales of spywork and trips to Africa. Stockman never defrauded either donor, Buckley insisted; rather, one donor gave money to Stockman through a charity in a “wink-wink deal” that would allow him to disguise a campaign donation and evade the associated taxes. The other major donor denied the true purpose of his donation years after giving it in an effort to shield himself in an FBI investigation, Buckley claimed. An enormous screen behind him blared, in yellow letters, that the government’s theory of fraud “was fabricated.” The defense called just two witnesses. The jury will now deliberate the charges that could send Stockman to jail for decades. A verdict is expected this week. In the days following, Stockman took to his still-active Twitter account to lash out at prosecutors. He decried the probe into his financial dealings as an ongoing conspiracy from the “deep state” — a result, he said, of his vocal criticism of the Internal Revenue Service. Days later, in a Houston courtroom, Stockman told U.S. Magistrate Judge Nancy Johnson he could not afford a defense lawyer because he had just $17 in his bank account. His defense expenses are being paid by a friend who has declined to be named, according to the Chronicle. Stockman’s case has only grown wilder since it went to trial last month. Shaughn Adeleye, a onetime operative for a now-defunct conservative activist group, testified last month that he was paid to pose as an intern in the office of state Rep. James White, a black Hillister Republican whom Stockman feared might become a political rival. Stockman funded that surveillance to the tune of $41,000, according to court documents. “Republicans love black conservatives. I’m worried,” Stockman fretted in a text to a political ally, according to a message shown in court. And Stockman has been deserted by the two former aides who were charged with him. Thomas Dodd and Jason Posey have both pleaded guilty and testified against their former boss. Stockman’s lawyers have said they did so only to bolster their own cases. “I’m sorry I had the lack of character to stand up to him,” Posey told Stockman’s defense attorney while on the witness stand last week.